"In the early stages, Holowczyc and Schulz succeeded in passing Schlesser’s buggy but then, a tyre puncture cost him some time. Afterwards, things looked promising again – until the pairing was stopped by a broken wheel. 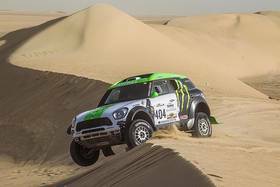 Fortunately, there weren’t any further damages on the MINI ALL4 Racing and they worked hard to fit a new tyre as fast as possible but lost several minutes, nevertheless, and had to settle for finishing sixth."